In many of the biggest political scandals of the past months – Luxleaks, Dieselgate and now the Panama Papers – we saw trade secret laws abused as a shield against investigation and exposure of how corporations are harming the public good, avoiding taxes and endangering public safety. Whistleblowers find themsielves fighting for their freedom in court – or in hiding. And yet, the European Parliament is about to expand corporate secrecy and deter whistleblowing by adopting the Trade Secrets Directive. Just as Wikileaks made headlines, the EU began toughening trade secrets laws, endangering whistleblowersTweet this! According to research conducted by Austrian investigative journalist Erich Moechel, preparations for the Directive coincided with Wikileaks revelations first making international headlines. He points out the discrepancy between the European Parliament’s decision to award LuxLeaks whistleblower Antoine Deltour with the European Citizen’s Prize 2015, after his revelations led to recovering several hundred million euro of tax revenue, while at the same time preparing to pass a law that will make the kind of prosecution that Antoine Deltour now faces for trade secrets disclosure in Luxembourg a norm across Europe. The Greens/EFA, my political group in the European Parliament, will reject the Directive in the plenary vote on Thursday April 14th, echoing the concerns by over half a million petition signatories across Europe as well as civil society organisations including the Confederation of German Trade Unions, Corporate Europe Observatory, Syndicat National des Journalistes and Whistleblower Netzwerk e.V. 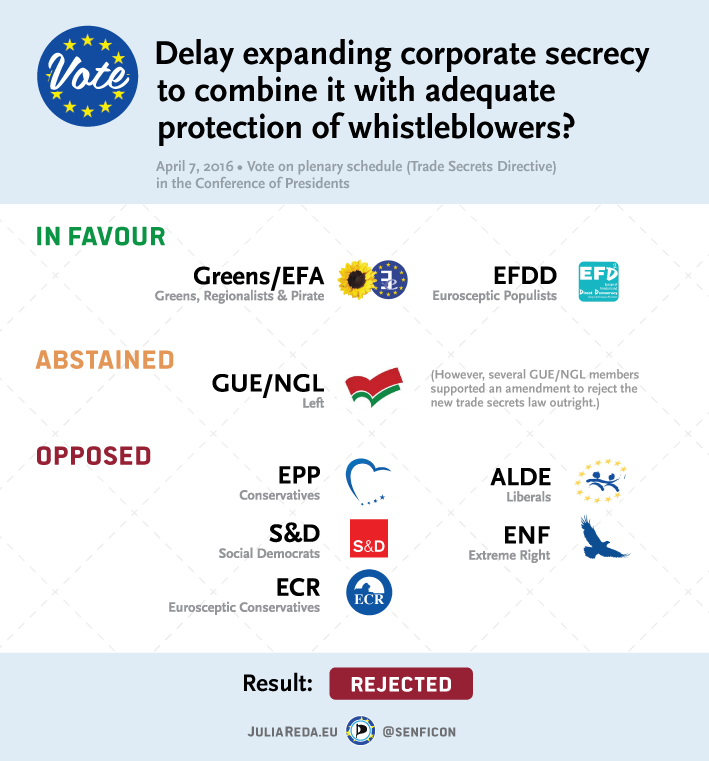 We proposed delaying the vote until the Directive can be paired with a Whistleblower Protection Directive, a draft for which our group will present on May 4. In rejecting this proposal, the EPP and S&D groups are deciding to press on to broaden companies’ abilities to keep important information away from the public eye and deter leaks while the Panama Papers continue to be front-page news. In many member states, the Trade Secrets Directive will broadly expand the definition of what kind of information may be protected. The new definition (Article 2) does not exclude e.g. information about illegal or harmful activities or pending investigations into such. It provides a floor, but not a ceiling for trade secret protection in the EU: Member states may have even further-reaching criminal law provisions. Existing criminal provisions are bound to be updated to cover the new broad definition, whereas the Directive’s exceptions will not automatically apply to them. Example: Germany today requires companies to demonstrate a legitimate interest in what they claim as trade secrets. Only business information can be protected – ruling out protection i.e. for information about an ongoing investigation. These essential limitations would be dropped. It appears that you have had unauthorised access to proprietary documents and information taken from our company […] We trust that you are fully aware that using information/documentation unlawfully obtained is a crime, and we will not hesitate to pursue all available criminal and civil remedies. The Directive will increase the ability of companies caught red-handed to sue whistleblowers and investigative journalists. It places the burden of proof of acting in the public interest on the whistleblower – and refers to the “general public interest”, for which no common definition exists. It does not preclude member states from making whistleblowers criminals. In January 2015, the French government attempted to introduce laws threatening 3 years in jail and a fine of €375,000 for disclosing trade secrets in anticipation of this Directive. While ultimately defeated, that attempt foreshadows the increased rigor we can expect to see in other member states. Given the massive power imbalance between whistleblowers (usually workers) and corporations who can afford protracted legal battles, this is bound to cause a significant chilling effect – even after the repeated demonstrations over the last few months that society increasingly relies on insiders to expose malpractice that evades national law enforcement and democratic oversight. Example: Edward Snowden’s revelations of massive global suspicionless surveillance would likely not meet the criteria of the Directive’s whistleblower exception. Dieselgate: The German safety testing organisation TÜV was unable to inspect car engine software for emissions testing defeat devices because car manufacturers claimed trade secrets protection. Deadly experiment: In a French drug trial this year, a man died. When scientists requested access to crucial data to find out what happened, the sponsoring company refused, claiming trade secret protection. Secret studies: The EU based its controversial assessment that the active ingredient of Monsanto’s Roundup herbicide (glyphosate) is “unlikely” to cause cancer – contradicting WHO findings – in part on industry-sponsored studies that are unavailable for examination by independent scientists due to trade secrets claims. In negotiations with the Council, an amendment was dropped that ensured knowledge gained on the job can not be classified as a trade secret. This exposes workers to the risk of being sued by their previous employer for 6 years after changing jobs. While the Directive does not itself introduce sanctions against the disclosure of knowledge under these circumstances, it leaves member states open to do so. We ask the Members of European Parliament to vote against this directive. It is suitable to restrict the possibilities of journalistic research, intimidate journalists and hinder editorial work by high cost risks. Do you really want a society where it is impossible for the public to access information crucial to the public good? The proposal […] bears serious risk to consumers’ and workers’ interests, to the environment and to human rights. The protection of whistleblowers – the majority of them are workers – will be insufficient […]. It is also disappointing that skills and expertise gained in the context of employment relationships can potentially be declared trade secrets. […] a lot of legal uncertainty still surrounds the circumstances in which investigative journalists and their sources can be sued. Faced with the prospect of having to pay compensatory damages, this uncertainty will lead to journalists and their sources keeping valuable information to themselves. Adopting a text that creates a situation where secrecy is the legal norm for companies’ internal information and transparency is the exception is clear proof of the European Commission’s preference towards corporate interest over public interest. Negotiations with the Council (trilogue) produced the current compromise text, which the Legal Affairs Committee rubber-stamped on January 28, 2016. Several provisions mitigating criticisms detailed in this briefing were removed at this stage. 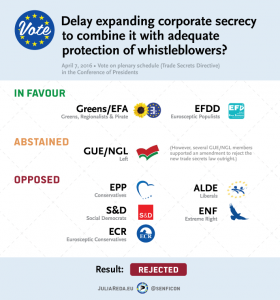 Thu April 7 — Greens/EFA co-president Philippe Lamberts requested to postpone the vote until the Commission will have proposed and the European Parliament and Council adopted a parallel text on the protection of whistleblowers. The two would then be adopted as a package. The proposal was rejected by EPP, S&D, ECR, ALDE and ENF; supported by the EFDD group; with the GUE/NGL abstaining. Thu April 14, after 12:00 — The text can no longer be changed. The Greens/EFA have filed an amendment to reject it outright (with the support of individual members of the GUE/NGL group). Wed May 4, 9:30 to 13:00 — The Greens/EFA group have commissioned legal experts to create a draft Directive to establish minimum standards for the protection of whistle-blowers across Europe. It will be presented at a public debate at the European Parliament. Business as usual despite the Panama Papers revelations? 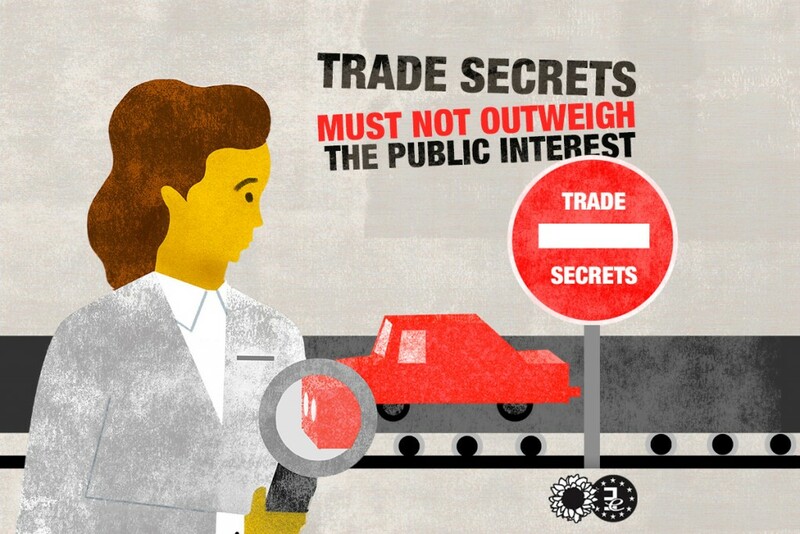 The EU is about to expand corporate secrecy and deter whistleblowing. Tweet this!